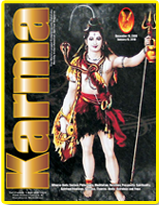 You are invited to join 500,000 readers who already enjoy the KARMA MAGAZINE, the first full-color metaphysical magazine in the country published by the Hindu Temple and Community Center of High Desert Inc., By Subscribing you get double benefit one you get the Magazine every month to your house. Second you are contributing to a Temple. There is no prescribed subscription amount but any amount is welcomed as Donation to the Temple. At the end of the year you will receive a statement from the Temple stating your Donated Amount. © Karmamagazine.org. All rights reserved.